It is here. 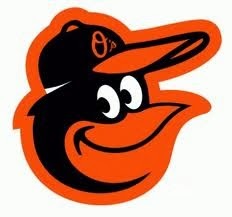 The inaugural Orioles Spring Training game will occur today at 1:05 PM against the Tampa Bay Rays. I liked their name a lot more when it was the Devil Rays! Bring on the Boys of Summer and the unofficial first day of Spring, despite the temperatures being in the teens. 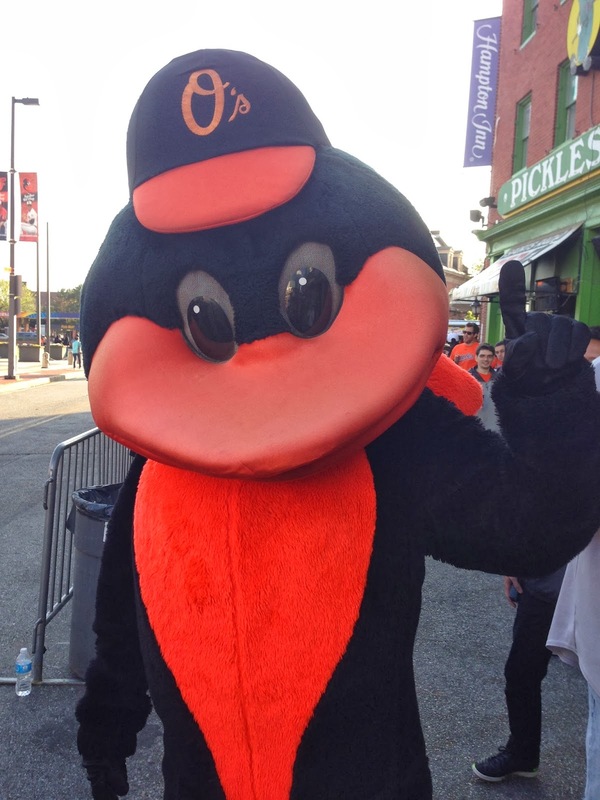 It is warm in Florida and in the hearts of true Orioles fans everywhere. I checked the baseball scores for the first Spring Training games of the season last evening while flying home from Anchorage. It made me 15 degrees warmer just thinking about baseball. Did I really care that the Pirates beat the Yankees? Or that the Rangers pummeled the Royals? Well, I always like seeing the Yankees lose (they are 0-2 so far in Spring Training games)--but in reality my interest was more to confirm that MLB Baseball was back. And in a few weeks I will take to the field with Mike as we surge forward for a second season of T-Ball. And despite the weather--Spring is here! I'll see you at the Yards! And maybe even in Sarasota in a few weeks! Sometimes, even though you are visiting a place with incredible natural beauty, the foreground of the view out the hotel window is less than spectacular. Such was my experience during my hotel stay in Anchorage. Don't get me wrong, it was a great hotel, in a good location, with excellent amenities--but, the view out my window was not awe inspiring. It was rather pedestrian and poor. To demonstrate that my poor view was not just in one direction, I took two images from my window just to prove visibility at any angle was obstructed. Yes, I know there is a beautiful view out there, somewhere, but not from my window. Bummer. I really would have enjoyed a constant view of the sound or the mountains--unobstructed. Yes, it is cold. But the length of the days have already become near equal to Maryland and therefore the darkness is not too bad. 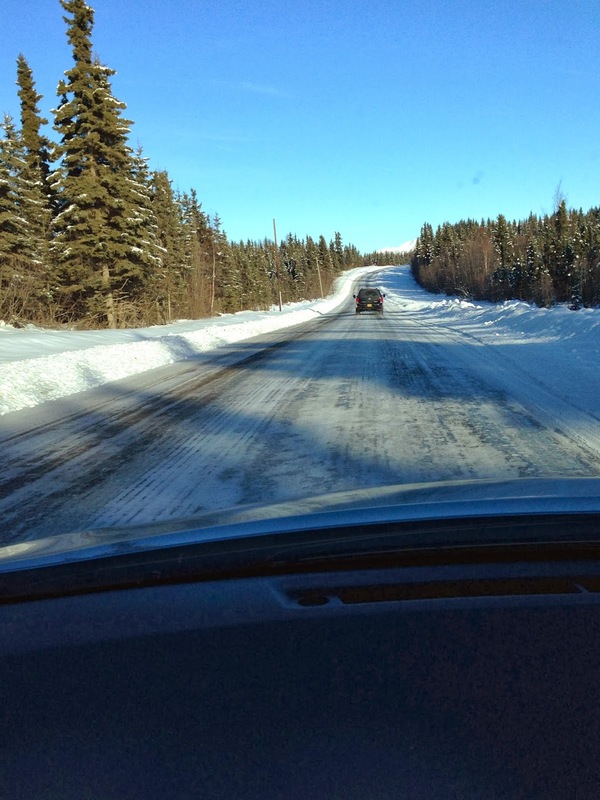 This trip has seen the best weather that I have experienced in Alaska--we can actually see scenery and drive almost unimpeded. That is supposed to change today as a storm moves through, but the images show how stunning everything appears. We saw Denali, Mt McKinley, in the distance yesterday. It was slightly hazy and I couldn't get a fantastic image of it, but it still is a great memory. They say that the weather is only infrequently clear enough to see that far away. Pop Quiz: When does a 14,000 plus foot tall peak look short? When it is between a 20,000 foot and a 17,000 foot peak. I saw the three peaks, whose names escape me now, Denali at 20,000 feet, and a peak in the image above to its left is 14,000 feet. Further left and off the frame is a 17,000 foot peak. I just wish the image was better--but it was the best my iPhone could pull off yesterday. They say the weather has been warm, and I guess it has been. The high today is supposed to be 36 degrees compared to 34 back at home. They are also calling for afternoon snow--which should effectively ruin any chances for more unplanned stunning sightseeing. Given the weather so far and the unintended views, I can and won't complain. I do not like snow and cold--but even so, it they can still make beautiful combinations when combined with fevers peaks and mountains. It was a glorious, but cold, day. Although I have been to Alaska on a number of other occasions, I have never enjoyed such a beautiful day of flying and sightseeing. It was just beautiful. 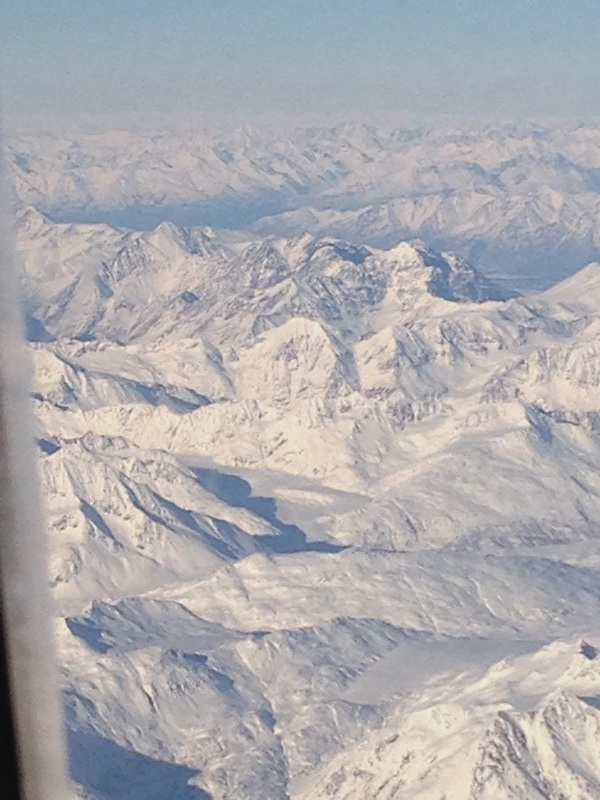 The snow covered peaks outside the airplane were magnificent. Awe-inspiring. Image worthy. And I was not the only one who felt that way. 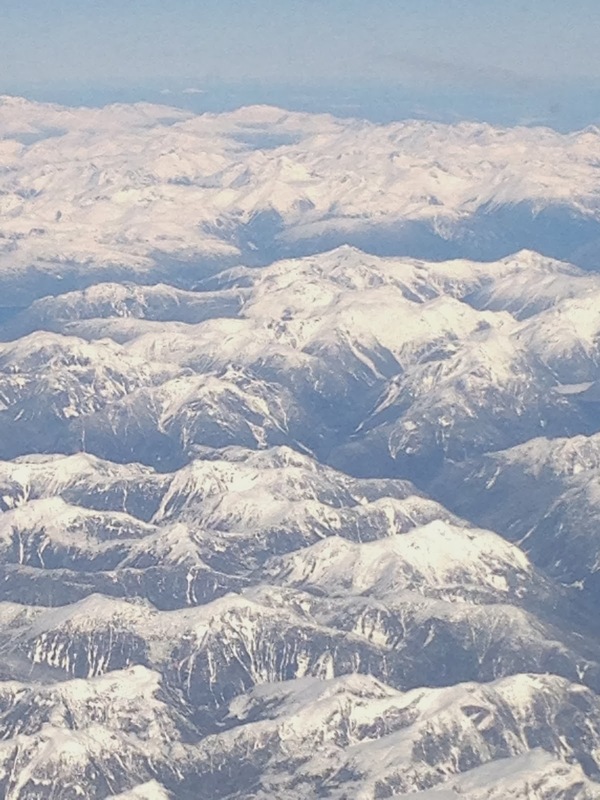 The entire aircraft was snapping images out the cabin windows. I snapped a few quick shots too. The blue water highlighted by the blue sky surrounded by the white capped peaks bathed in bright sunlight was a sight I will not soon forget. I wished the WIFI on the aircraft was working better so that I had a better idea where I was along the flight path from Seattle to Anchorage. 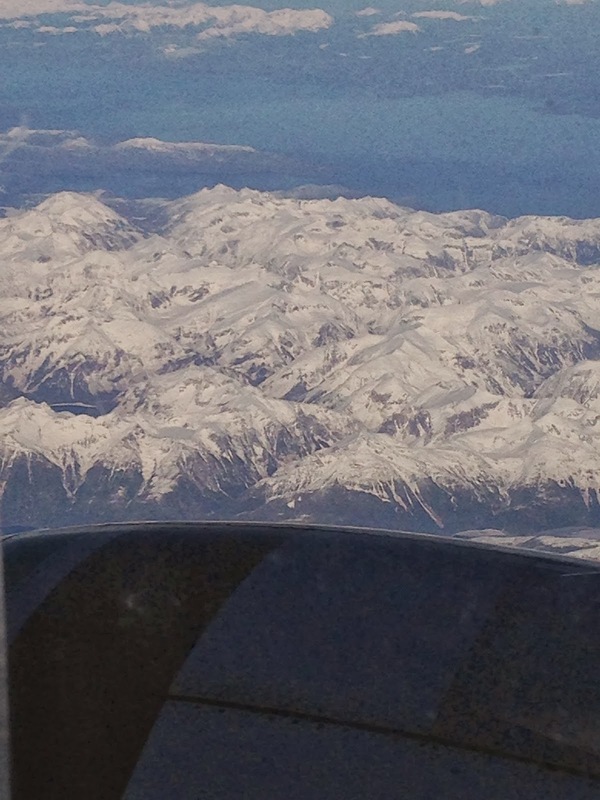 All I know is that were were flying in the vicinity of Sitka. But it really didn't matter. It was awesome, simply awesome. Yes, it was cold, too. I saw glaciers and I saw Denali in the distance as we approached Anchorage. I was mesmerized and for only a very rare time, I wished that I was in a window seat to soak up all of the Creator's masterpiece. Do not misunderstand me, just because I appreciate the frigid beauty does not mean that I want to be on the ground lost among the snowdrifts. I put down the book that I was reading and just looked out the window. Sadly, the images do not do the scene justice--but they are etched into my mind. 1. Two blue-sky days of mid-winter respite in a row! We were so lucky! And even better, we enjoyed them. 2. A longish walk around a frozen Centennial Lake in bright sun and under fantastic blue skies--what could be better? Yeah, I almost forgot, laying on a beach in the hot sun with a cool drink in my hand and the sound of lazy waves hitting the beach. 3. I met some wine and travel bloggers yesterday. Thinking. 4. This past weekend was the last without baseball until after the World Series. Spring training games begin this week! 5. The return of the cold weather just makes me want to enjoy Springtime that much more. 6. The Olympics have ended. Yay. It was a great run and it always gave me something different to watch on TV. 7. The US finished second in over all medals and fourth in golds at the Olympics--I think we could call it a disappointing performance. 8. And thinking of the Olympics, the Russian Revolution broke out on this day in 1917. 9. Just to be balanced, the Mexicans attacked the Alamo, defended by 182 Texans and supporters, on this date in 1836. In a stunning change to the cold and oppressive weather pattern of the past few weeks, yesterday was glorious! Absolutely glorious. Blue sky and warmer temperatures which actually flirted with and then made exactly 60 degrees about 4 PM made for a fantastic day. The snow of the past few weeks is melting, the yard is soggy--too soggy to walk on it, but the day was a memorable one because I didn't waste it. I enjoyed it from start to finish and I know I stood for moments at a time enjoying the warmth of the sun on my face and marveling at the depth of the blue sky. I can believe that Spring is close! I dearly want Spring to arrive and rescue my heating bill from Winter's grip. I think we set a new record last month! Ugh! I don't like records like that. Even my new Fitbit enjoyed the day, logging over 14,000 steps as I fully enjoyed the great day that had been provided for my activities. Yes, there was a long walk, but I also the last basketball game of the season for Ethan and Jax. It was kind of sad, but the ending means that baseball and lacrosse are close at hand and the transition from inside to outside sports is about to begin. Yay. Today is dawning bright, too. Maybe I will enjoy two days in a row of great February, unseasonably warm weather! The forecast is for a week is cold weather as the polar vortex returns, however, maybe, just maybe it will be Winter's last gasp! Did You Notice the Sodium in that? 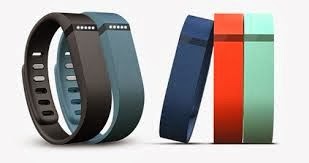 I have a new Fitbit, given to me by my loving wife so that I could participate in the family fitness activity. It was a great idea and I am having a lot of fun with it, although, even by playing racquetball daily I am not competing very well because I cannot wear my Fitbit while I am at work. and therefore lose credit for 8 or more hours of activity, albeit it mild, everyday. I have been fascinated with the whole idea of tracking steps and working to improve general health and fitness for a while now, but I hadn't taken the leap to actually acquire a tracker of my own. Some insurance companies provide money back for meeting step thresholds and doing other healthy things. Mine doesn't and the place where I work needs to improve its commitment to employee fitness, but that is a thought for another time. The most interesting part of my five day experience has been in tracking my food intake and understanding not only what I eat, but what is in what I eat. Seriously. On my first day of logging my food and trying to understand what is in what I eat, I varied from my usual lunch fare of chili--and for those who know me, they know that that in and of itself was a monumental occasion. I decided to eat a healthy looking Cuban Pannini sandwich offered by the cafeteria. Mmm, it tasted good. And then I looked at the nutritional information regarding this sandwich as prepared by the company which has the food contract at work. Ugh! I got my entire daily allowance of sodium in just that sandwich! And while I thought I was getting some fiber, I would have done better having chili. And then I went and added mayonnaise to the sandwich, which skewed a few other items, but the bottom line was healthy looking is not healthy. Did you notice the sodium? My total sodium intake for that day was about 3400 mg. I did much better by eating chili the next day ending up with a total sodium intake of only 2200 mg for the day. I've been looking at sodium in food since then and am appalled at how much is added--it is everywhere except in one of my favorite beverages! There is no sodium in wine. I'll just have to drink more wine to offset the sodium in what I eat. Anyone who has had the experience of riding with me in a vehicle lately knows that I believe there are frustrating drivers with whom I share the road. Frustrating because despite what is happening around them, they apparently cling to the belief that they are the center of the world and their actions are therefore justified despite the angst they cause for those around them. It can be extremely frustrating. Don't get me started on turn signal etiquette, or lack of etiquette. I just believe that failure to signal turns and lane changes represents a fundamental disrespect for the other drivers on the road. But there are other frustrating drivers out there, too! Yesterday morning, for instance, there was a driver in downtown Baltimore who clearly wanted into my lane on a tight street using no turn signal. I was trapped with a bus very close on the passenger side and this driver crowding over the lane on the driver side. Even Chris mentioned that we seemed seconds from an imminent accident. Turns our, the driver was just making a wide, for some unknown reason, left hand turn and wanted a piece of my lane before executing the no signal turn. I have found frustrating drivers in other places as well. Driving 55 MPH on I-95 where the speed limit is 65 MPH and traffic travels above 70 MPH. Or there is a road, Telegraph Road, where the speed limit is 50 MPH and for some strange reason some drivers want to travel at 40 MPH. While traveling at lower speeds certainly is their right and the can do it, failing to estimate the impact on the drivers around them is clearly dangerous. I an equally frustrated, and scare, by the speed demons as well who believe that other cars on the highway are merely obstacles, like in a video game, to maneuver around at high speeds. I am convinced that they are going to cause a terrible accident should one of the drivers they are maneuvering around panic and hit their brakes. I believe that driving habits represent a person's view of interaction with society and their interaction with or respect of other people. 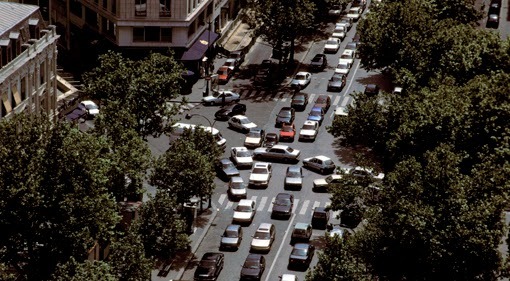 Self-centered people may be frustrating drivers. I don't know, but I would like to test the hypothesis some day. Just do me a favor, consider the traffic around you as people and not just cars on the highway. Recognize the potential impact from your actions and be a considerate and not a frustrating driver. Amazingly, I noticed it Tuesday and confirmed it yesterday. It is light longer! Yes, it is bright by 7AM and I can still see remnants of the dusk until after 6PM. In fact for yesterday, sunrise was at 6:51 AM and sunset was at 5:46 PM. That totals 10 hours and 55 minutes of sunlight--if only the colds would move along and let the Earth warm. 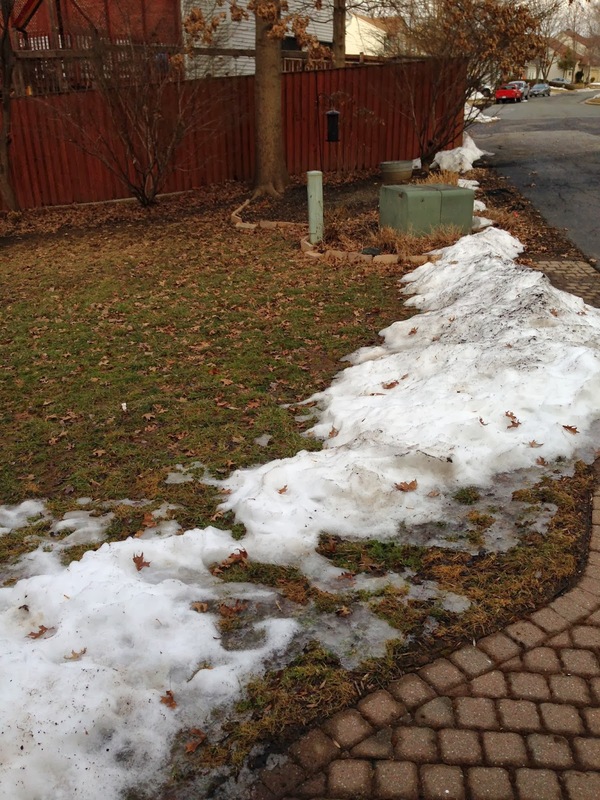 The snow remains almost everywhere, but I do see signs that the glacial cold is receding. I suppose there isn't much I can do about that because nature will eventually replace the snow with brown dormant grass and mud; followed by green grass and flowers! I think I should charge up the battery on the tractor to prepare for the mowing season which should begin next month! Yup, next month. It is only about 10 days away. I even went for a walk last evening to enjoy the 50 degree temperatures and sunlight. Well, and to get a few more steps on my new Fitbit. IT already knows too much about me and my lazy, unhealthy habits. I even found out that a glass of wine, a bit glass, contains 125 calories. So I am trading cookies for wine. Some people have a knack for creating drama where there needn't be any. I see it and experience it time and time again. I wish there was some other way in which they could find happiness rather than creating tense, dramatic situations during periods of time which otherwise would be calm and peaceful. Drama happens enough on its own. For instance, the other day a couple helped me with a big project for most of the afternoon. Life was great and we went shopping and later enjoyed a bottle of wine after the work was over. Then, without warning, the couple was advised of a serious family emergency requiring a no notice six hour drive leaving at 8PM. My point? There is enough drama in life without creating additional opportunities. What is needless drama? Picking a fight with a friend or a spouse over a long thought settled issue. That constitutes fabricated drama. Another example might be being a "poop" in the middle of the mall because the group is moving too quickly or too slowly. I admit to being this kind of drama queen on at least one on occasion. People who preach doom and gloom on an otherwise sunny day? Fabricated drama queens! Another form of fabricated drama is setting unreasonable expectations for others and then being disappointed and holding it against them after they make an admirable effort to comply. Drama queens as they are called are just dying to make themselves the center of the occasion or situation. It is a self centered approach that commandeers a situation at the expense of others. We've all seen it happen. The recognition gained for introducing fabricated drama is generally negative. Get over it and help others to enjoy the day rather than focusing on needless drama. The drama in life will come about all on its own, no assistance is required. Some of my family recently returned from a week in Spain--well actually it was Barcelona, which it seems if you ask the residents in not really Spain but Catalonia. As they were telling the tales of their travel, including a sobering view of the Spanish Civil War, not well taught in U.S. schools, one of the customs they noted was the long afternoon siesta time and the late dinners (except on Mondays). It sounds like the perfect place to live. I love afternoon naps and we usually do not eat dinner until later--sometimes after 8PM. Now for the weird part. 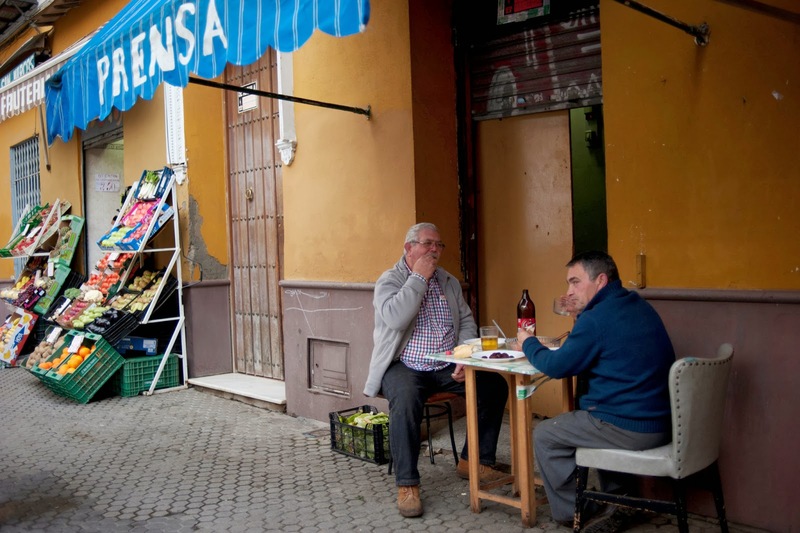 This morning's New York Times has an article about how business forces in Europe are causing the Spanish to reevaluate their fundamental approach to life--the afternoon nap and dinners that begin while much of the rest of Europe is thinking about going to bed. Interestingly, as I read the article, there is a great deal of resistance to the idea of change, but the truly fascinating part is that some of the changes the Spanish are resisting were instituted by the not well loved dictator Francisco Franco. I would have thought that the people would have been anxious to reverse anything that Franco implemented during his almost four decades of iron-fisted dictatorship. On the other hand, I also feel bad, because I am sure that it is the American global business model of 9 to 5 workdays which is colliding with the slower Spanish lifestyle. We continue to force this model onto the world and local lifestyle and traditions are lost in the quest for finance and productivity. I also find it interesting, just a short week ago I would not have read the article in the Times, nor would I have had any background in the culture, but now after hearing stories of the region from first-hand travelers, I have both an interest and a perspective. 1. Spring begins on March 20th--just 31 days away. Coincidentally, I head off for Orioles Spring Training in Sarasota on that day. Let the celebration begin! 3. Pool opening day is 75 days away now scheduled for May 3rd! 4. I watched the thrilling USA-Russia hockey game on Saturday morning. I saw the Russian President, Putin, in the stands cheering on the Russians on their home soil--but I really missed hearing the chant that usually accompanies US teams at home or on the road-- USA, USA, USA. 5. I feel like the snowman in the picture. 6. The Olympics seems longer this year. 7. Happy President's Day. We've had some great ones! And, I get a day off to celebrate them. 8. We are not the only ones with snow. An article in this mornings New York Times reports: Japanese car makers including Toyota Motor Corp and Honda Motor Co suspended operations at some of its plants in central and eastern Japan after heavy snow disrupted their supply chains and prevented workers from commuting. 9. I'm not one to want to hurry time along, but February can end anytime it wants and the sooner the better. 10. I feel the wolf in the image was justified. While reviewing the aftermath of the great Valentines Day storms, I realized that I had taken a time-lapse imagery session of my driveway and the street in the aftermath of the storm. I am still amazed how quickly the 46 degree day on Friday helped to get the snow and ice off critical driving surfaces. I am also amazed that I was shoveling snow and ice until late in the afternoon. I never finished clearing everything until about 4:30 pm on Friday and was braced for up to five more inches of snow which thankfully never materialized. It took time to get the snow removed. But most of all, it took sunshine. And that was the amazing part. For all of the work it took to remove the snow, shovel by shovel, the snow melted it and made the biggest difference. My biggest shock was how quickly the street cleaned up after the plow finally came. The street went from snow packed and icy to wet and very passable is a few short hours. All due to the sun. And so, another storm has passed and by the end of this week, the temperatures will be in the 50's and maybe we can say good-bye to the snow for the rest of the season. Next year I'm going to pay off the ground hog so he doesn't see his shadow! 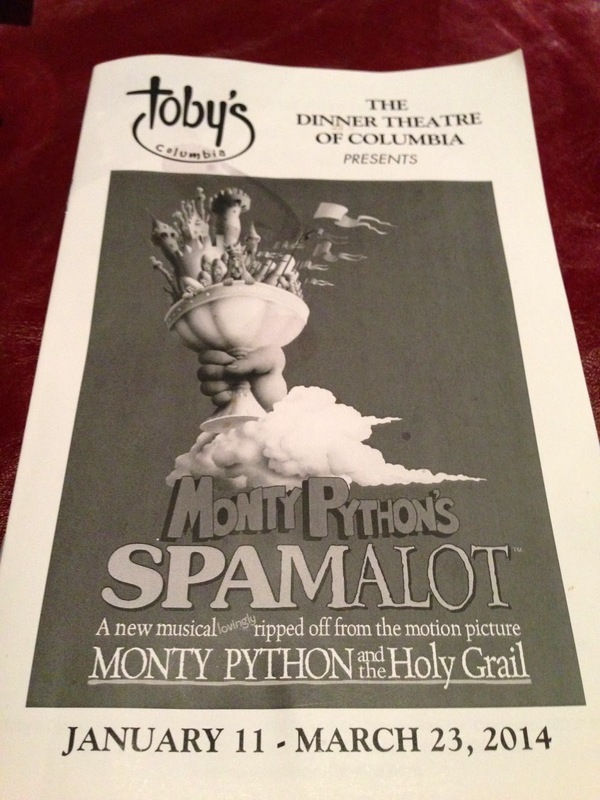 Chris and I enjoyed Valentines Day dinner at Toby's Dinner Theater in Columbia, Maryland, watching their production of Monty Python's Spamalot, which is a theater adaptation of the movie Monty Python and the Holy Grail. We enjoyed the show with a number of our closest friends and had a great evening of dinner and theater. I am going to state, right up front--I do not enjoy the Monty Python humor as do many other people. But, despite that, I felt that the production last evening at Toby's was a first class production. Toby's provides an intimate setting to watch a theatrical event. Being close to the action and the actors increases the enjoyment of being part of the show. However, the seating is tight and uncomfortable similar to a real Broadway show and the buffet style food is just that--standard fare buffet style food. Toby's Dinner Theater production of Spamalot was excellent. The actors were extremely talented and the musical production was big very well executed. I found that Toby's unique stage area made for a very involving and engaging production. Two actors stood out as worthy of additional mention. Lawrence B. Munsey, playing King Arthur was clearly the star of the show and carried the production. David James also turned in a spectacular performance playing the Historian, Not Dead Fred, the Nun, a French Guard, Minstrel, and Prince Herbert. There were no weak performances and each of the multiple roles played by most of the actors was enjoyably and professionally executed. Recommendation: It was an enjoyable evening of theater and friends. If you enjoy Monty Python humor--go see this production. Two Storms Down, Another in the Way! Just when I thought the storms were over--and I could begin digging out for good with the promise of springtime weather coming soon, another "Clipper" is on the way with 1-5 inches, tonight. I'm sitting here watching the continuous weather reports, like I could make them change. I wish I could make them change. Our street remains unplowed as of 7AM and my driveway is currently more akin to an ice skating rink than a driving surface. 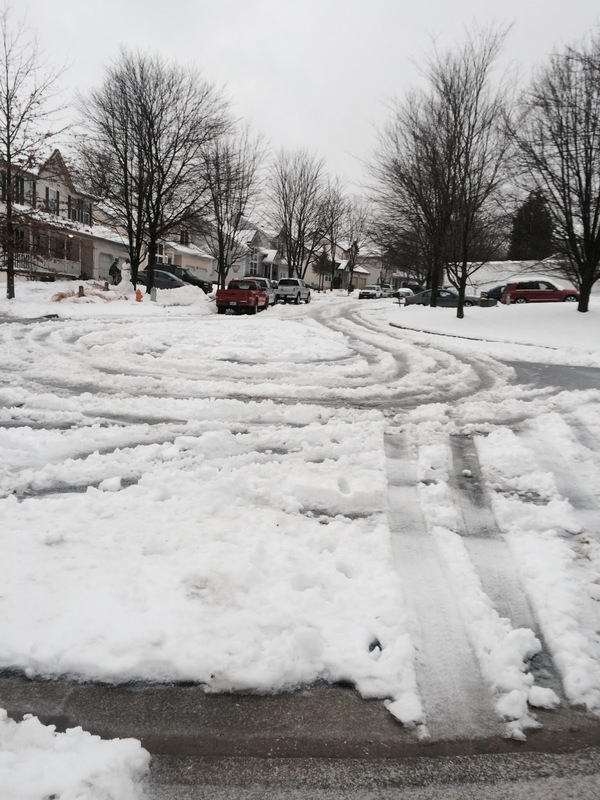 The deep ruts in the street make driving nearly impossible. My sidewalk is iced over--and now with the temperatures warming it has a layer of water on top on it. It is cold! I think I need a palm tree fix. I heard it this afternoon. Thunder! During the middle of the sleet storm, it was then that I decided to finish the shoveling before the oncoming additional 4 inches of snow expected this evening followed by the return of the deep freeze. All of the slush should turn into ice before morning. What a joy! My street still has not been plowed and if the additional snow arrives and then freezes--it should be a lot of fun tomorrow morning. 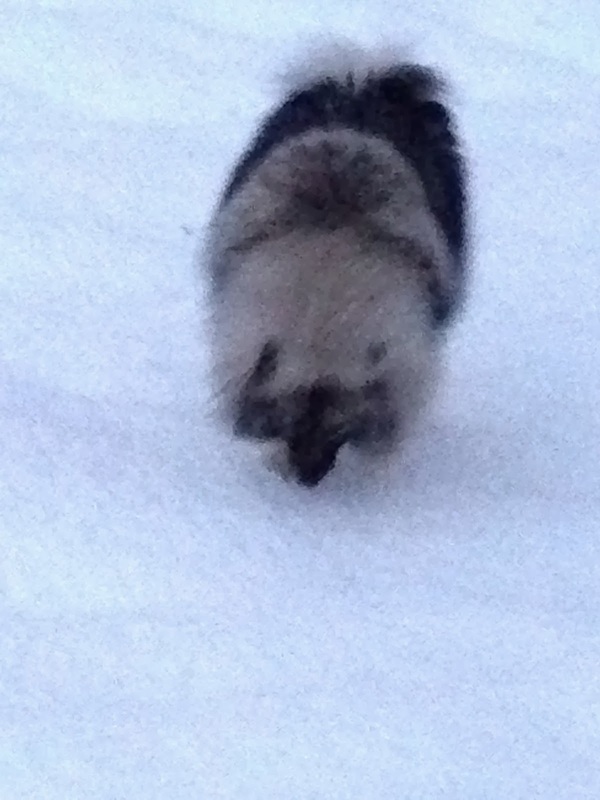 Here is a video that Chis took of the Thunder Sleet--although she did not get a thunder clap on the video. 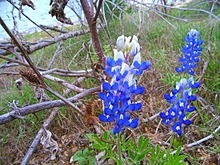 When I think of the Texas Hill Country west of Austin, Texas, I think of Springtime and bluebonnets. I remember driving through the region many times during the years I was assigned to the Air Force base in San Angelo, Texas, and wondering why the base couldn't be 90 miles east of where it was. The region is beautiful and I always enjoyed the drive, except for one icy, winter day. But that written, I never associated the Texas Hill Country with wine! Who knew? I didn't. Turns out, Texas is the fifth largest wine producing region in the United States! Wow! And then there comes along this cool contest, sponsored by Wine Enthusiast, to help people become familiar with Texas and Texas Hill Country wines. I am writing this article to hopefully win a trip to Texas as a wine destination! Who knew. If I win the contest, I definitely want to experience all the various forms of Texas wines. I am familiar with many other U.S. wine regions--California, Washington, Oregon, Virginia, and New York--but I dearly want to add Texas to the list. Not only that, but if I could travel to the Texas wine country during the springtime, I could take a lot of pictures of the Texas State Flower. With red wines rated in the low 90's and high 80's--there has to be some excellent drinking. You can review the Texas wine ratings for yourself, but wouldn't it be better to do them in person? I thin the Llano 1997 Signature Red, rated 91 for $9 looks especially enticing! They do everything bigger in Texas, so they say. Maybe that applies to wines, too. Yes--it snowed. Get over it! We were forecast for 6-10 inches and measured 11 inches on the back deck. Well, sadly, the forecasters were mostly correct. Now sleet is falling and later today, just to add insult to injury, we should get another three or so inches. What's worse? The neighbor's snow blower is broken. I spent an hour on it last evening and could not get it running. It's not getting gas. It ran fine, for a few seconds, when I poured gas into the cylinder, but I could not find out why it wasn't getting gas on its own. I'm worried the intake valve is stuck closed. So this will be a snow removal by hand operation. It may be a long day. I think I am going to get a fire going in the fireplace and think about shoveling. Perhaps it will disappear. It is 12 degrees outside my house this morning as dawn prepares to wake up and start the day. it is supposed to be a cold but fairly nice winter day, right up until the snow begins falling. The news is abuzz again with the threat of a significant storm which is forecast to drop 6-10 inches of snow upon a region ill equipped to handle it. I was joking yesterday that now that the Super Bowl is over, the best place to buy TV commercial time is before the local weather forecast. Everyone is watching the weather. The stores reportedly are already running short of milk, bread, and toilet paper. The hard part about storms like this are the thousands of people who lose electrical power and are forces to stay warm huddled around fireplaces. Some in our area may lose their power for a week or more. Some are only now recovering from the ice storms of last week. 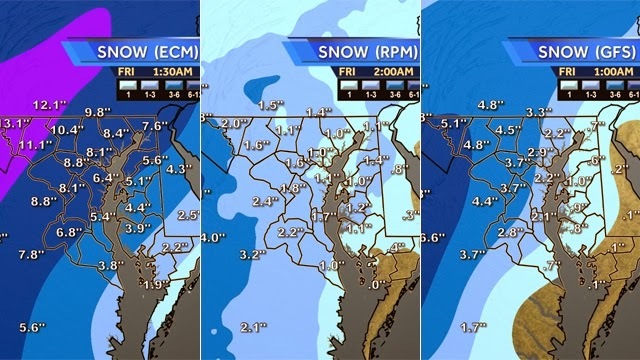 Who knew there are three models used to forecast snowfall? Sadly, I did. It comes from living in Maryland for almost 20 winters. Today, I expect all of the conversation will be about the snow. The storm is so bad already in the south that airline flights are being canceled for today and our region will see many cancellations tomorrow. I just hope the people in Atlanta do better this time than they did during the last storm. Who wrote that stupid some about "let it snow, let it snow, let it snow?" (Sammy Cahn and Jule Styn in 1945). I know the old saying is that home is where your heart is, but in my case my heart is where my dog is and so in my case my heart and my dog are one. Or even weird. But I love traveling with my dog. The past week we have been living at my daughter's house while they explore Spain and having my dog around has kept me sane. It is not that she does all that much, but her comings and goings and need to head outside every couple of hours adds a sense of normalcy to a life in upheaval. And I really like having her park herself next to me to be scratched behind her ears and I also enjoy having her lay at my feet. Today, the expectation is that I will return home to my more normal life and I know that Makayla will appreciate the transition home as well. She is not a huge fan of vacations--I think she has a problem with change, but of course the good news is that she just accepts where we are at and enjoys the fact that she was not left behind. Home is where my dog is--what could be better? 1. The dusting of snow yesterday reminded me that winter's grip is still strong. 2. Here is a difficult story, especially for animal lovers. 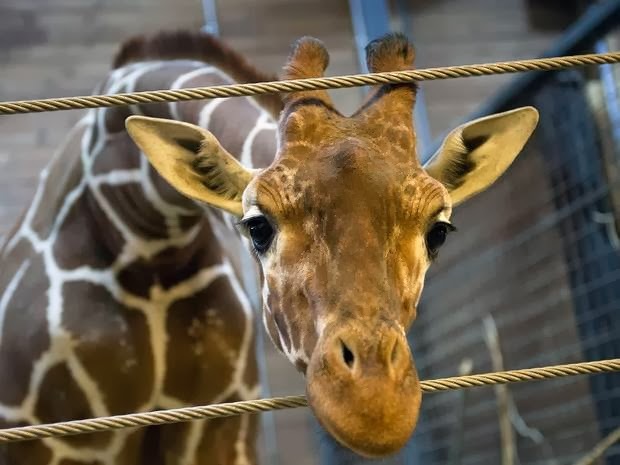 Danish zoo kills healthy giraffe, feeds body to lions. I'm feeling there had to be another way. I read the story and was appalled at how this whole thing was handled. Especially the part about doing it in front of an assembled crowd. Maybe I have a touch of anthropomorphism, but this is just not right. 3. Flappy Bird the incredibly successful new app is no longer available. Too much success, it seems. I had heard about the game, but hadn't downloaded it yet. 4. The Olympics are everywhere, but the U.S. doesn't seem to be doing that well right now. At the end of Day 2, the U.S. is in third place by virtue of garnering two gold medals. 5. There is something really exciting about dropping family off at the cruise terminal and know they are heading off on a week long journey to warmer climates. My, those cruise ships are huge. I wish that I could be sailing with them. 6. OK, this could be a bit controversial. Why do members of Congress believe that they can or should get involved in a name dispute with the NFL? Seriously, the name of an NFL team is clearly not within the powers given to Congress by the Constitution. Who decides when a name or a word transitions from showing honor to a slur? I think the Congress and all of the other legislators should do their constitutionally appointed jobs, which as we have seen they don't accomplish very well, and stay out of these kinds of disputes. One other thing, why does the NFL have tax exempt status--that his wrong! 7. I learned something else in the article referenced above--Oklahoma means Red People in Choctaw. So we have a U.S. state that perpetuates a slang term for First People? Are they going to change Oklahoma's name? 8. The thought of living in a high rise in a big city scares me and here's why. Read Trapped by a Fire on the 20th Floor. There is something reassuring about knowing that I can crawl out onto my room and jump to the ground without injury in the event of a fire or emergency. 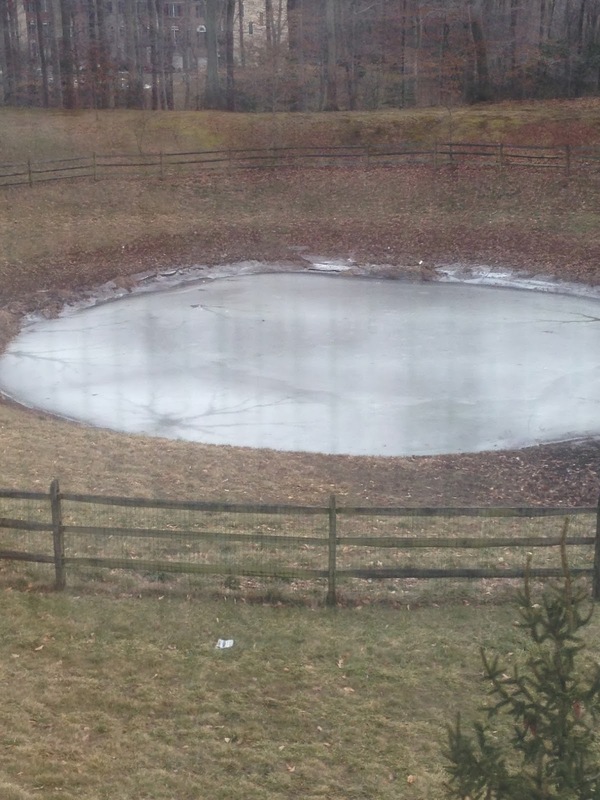 Although there has been a bit more sunshine lately, the temperatures are still too cold to think and the ice on the collection pond, as seen through my daughter's window, confirms my suspicion that is is just too cold outside. Fortunately there is a fence around the collection pond or I am sure someone would have drowned trying to ice skate on the seeming inviting ring of ice. There is no snow in the area and so looking out the window, except for this circle of ice, might lead one to believe that spring is close. But it is not. With daily high temperatures in the low 30's--often not breaking above freezing, the region continues firmly in the arctic grip of Winter longing for warmth and moderate temperatures. 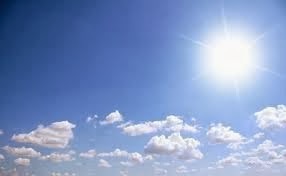 It is supposed to reach 36 degrees today! It may feel like a heatwave when it does, except for the snow that is supposed to accompany the more moderate temperatures. I guess I'm a bit jealous that some of my family are lucky enough to be traveling to warmer climates. Some are leaving today on a cruise for the Bahamas and diving, while others are enjoying the relative warmth of Barcelona (yup Spain) on the Mediterranean coast where the temperatures are cool in the 50's-and 60's, but compared to 20's and 30's it must seem like a summer heat wave. Pitchers and catchers report to Spring Training this week--so summer and warmer temperatures cannot be too far off. I can even buy tickets to the Orioles Opening Day this week! And my own journey to warmer temperatures happens in about five short seeks as I sojourn to Sarasota for some dune and baseball. We are doing four games in four days this year! But the ice remains--unmoved. Growing stronger which each passing hour of temperatures below freezing. It will be gone soon! And so they begin. 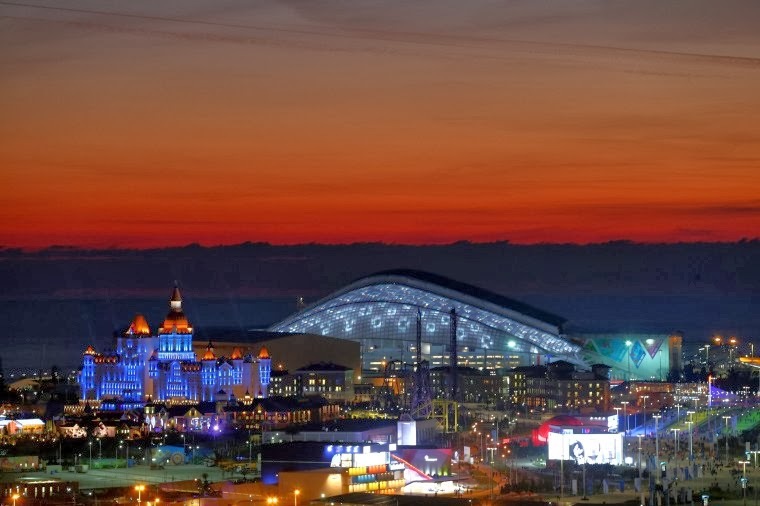 For the next two weeks the world will be watching athletes compete in the still unifying spirit of the Olympics streaming from Sochi, Russia. I was impressed with the opening ceremonies--the pageantry seems to get bigger and more exotic with every succeeding Olympics. Being a Winter Olympics, however, I do not long to be there. It looks cold. 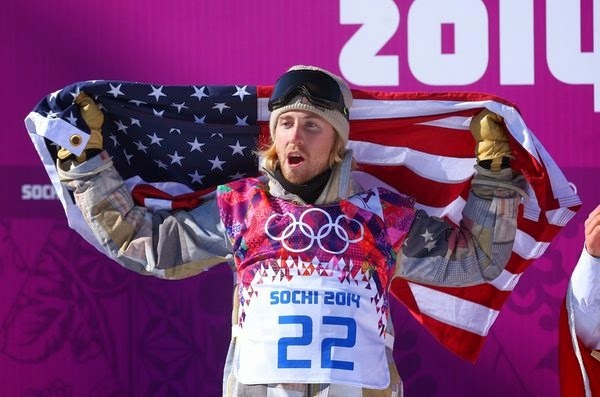 The U.S. surprisingly won the first Gold Medal of the Olympics which Sage Kotsenburg winning Gold in the Men's Snowboard Slopesytyle. I didn't even know what that was until the other night when I watched it on TV and it is a pretty awesome looking sport, racing down a hill on a snowboard doing flips and twists. Watching the opening ceremonies with the parade of nations reminded me that it is possible for all of the countries to come together for sports and not be so mindful of the differences of ideology or religion. That made me feel good. I wish it could happen more. I smiled as the Tonga team entered the stadium. Really? A polynesian island has a team in the winter Olympics? Their lone Olympian will compete in the Luge. I did think the 230 members of the U.S. team were a bit unruly as they entered the stadium in comparison with other countries, but that, for what it is worth, is who we are I guess. Well, it is underway and it will be fun to watch. It has to be better than anything else on TV. Thursday's. Blah! 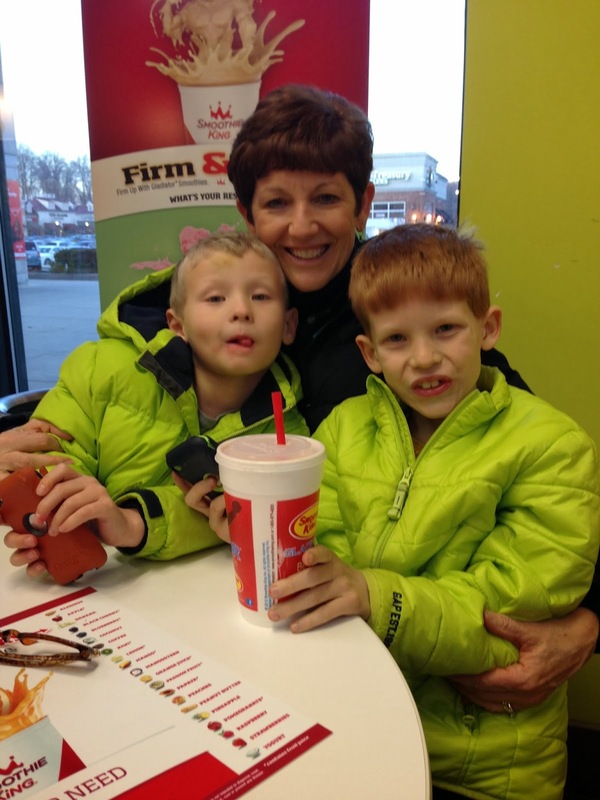 They are my personal toughest day of the week. I am usually up early, like yesterday at 4:40 AM and then on the racquetball court at 5:30 AM. I follow that by being at work by 7:00 AM and then I am strapped to meetings at 8, 9, 11, and 12 on a good Thursday. 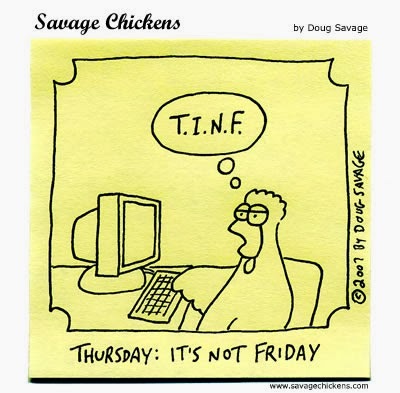 On many Thursday's, like yesterday, I had additional meetings at 9 (yup, two ( AM meetings) and a pick-up meeting at 10. And, as an added bonus, I got to leave work early to make a run to the airport and then watch two Ethan and Jax for the evening which will continue into next week! So, as an added bonus, last evening I got to experience the joys of homework, the success of being installed on the Principal's Honor Roll and a celebratory trip to a slushy store, getting fitted for a lacrosse uniform, and dinner at Chik Fil A.
I'm not sure there is enough wine in the world to compensate for the Thursday that I had. And I get to do a lot of it all over again today! Yay! 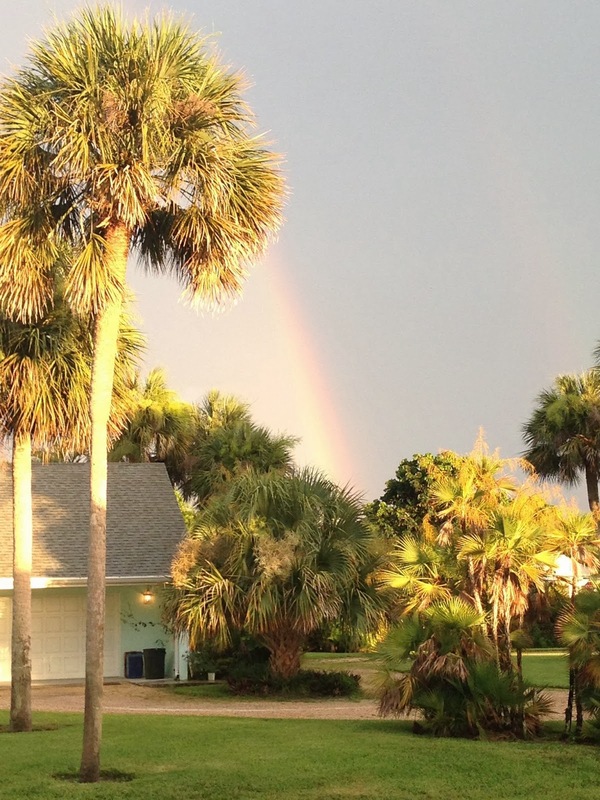 I was chatting with a friend the other day, amidst the snow and cold, and we both agreed that the though of being in Florida, or some other warm place, keeps us going despite the cold and icy weather. They are so many warm places to dream of visiting, yet, there is something satisfying about going someplace familiar. And warm. There is a car in my garage that embodies the essence of warm summer days--and it hasn't been driven in a couple of months. I have an almost overpowering urge to get it out, put the top down and drive 80 miles an hour on the interstate with my hair on fire in 20 degree temperatures, just because I can. And then pneumonia would probably set in. But I would enjoy the moment with no regrets. 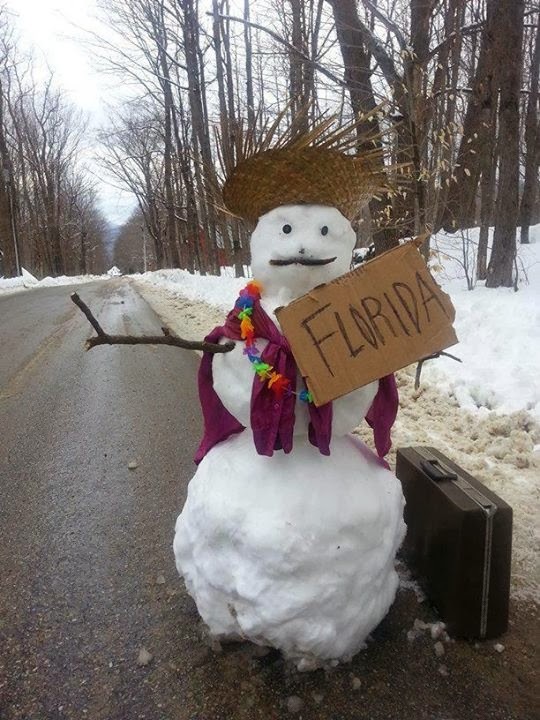 Perhaps it I am feeling it because two of my children are headed off on trips to potentially warmer climates. Fortunately there are only a few more storms between me and Spring Training in Sarasota! Next year we are going to go earlier to escape the cold. I heard the funniest thing last evening about keeping husbands happy in the face of a miserable attitude. The three steps to change a bad attitude into a good one were called the "Toddler Approach." 1. Feed them. Are they hungry? When did they eat last? 2. Give them a nap. They are tired. 3. Wash them. They may be dirty somewhere, but this only happens in about 3 percent of the cases. Patrick and I discussed "Toddler Approach" to being handled, as we are both husbands. He felt that the whole world always looks better on a full stomach. I have to concur, I remember being in Disney World last summer and the experience was beginning to degrade in the face of rain and exhaustion. A great lunch saved the day. I also know from personal experience that life is a lot better after an afternoon nap. As for item three-we had never really experienced the idea of being dirty and needing cleansing. And then it hit me, these three steps to taming an ornery man weren't funny or cute--they were true. What were you doing last evening at 6PM? I was arriving home after another less than successful racquetball outing, but . . . I noticed that it was not yet fully dark at 6 PM. The daylight grows long day by day. We are back up to 10 hours and 18 minutes of sunlight. Sunset was at 5:28 PM last evening. Maybe it was a bit of wishful thinking, but I believe that I can see the daylight growing longer. I can almost hear the ocean waves lapping the shore while enjoying an end of day drink in the 8:30 pm timeframe. It is coming, soon. Before long, as I leave the club in the morning just before 7 AM, I should be able to see see the first glimpses of the sun just before the horizon and believe that warmer weather, green leaves, and flowers are close behind the obvious seasonal change. The dark days are ending! And to add insult to injury, Sunday as I was cruising around the yard I noticed, in places where the snow has melted, that springtime flowers are beginning to poke up into the still too weak sunlight. What hardy plants they must be ready to face the continuing onslaught of winter weather that is in store for us. Like the flowers in my garden, keep the faith--Spring is out there, somewhere! 1. February? Really? Already? I thought we just celebrated New Years! 2. Was it Super? Or was it just a commercial blow-out? You make the call. Has the "Big" game become so hyped that any semblance to football is merely the shape of the ball and number of players on the field? 3. Did you know that despite the hype and the 60 minute clock, there is only about 14 minutes of actual game play packed into 3 and a half hours of Super Bowl game time. The halftime show lasts longer. 4. Given the significant accumulations of snow in today's forecast for the Baltimore area, I guess Punxsutawney Phil's forecast was solid. Unfortunately. 5. Ten days until pitchers and catchers report to Spring Training and we can get on with the prelude to Spring as baseball ramps up for its eight month run. 6. Makayla, my dog, is funny. In the morning she is ready to charge out into the yard to take care of business, right up until she notices it is raining and then she puts on the brakes and slinks under the eaves to keep from getting rained on. I suppose I need to get her a doggie umbrella. 7. What was your favorite Super Bowl commercial? 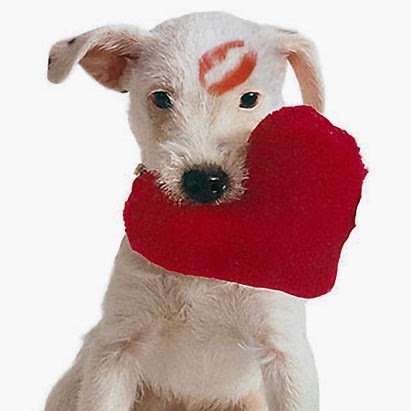 I liked Budweiser's Puppy Love, was intrigued by the first Maserati commercial that I have ever seen, and enjoyed the Jaguar commercial--just because. 8. One last Super Bowl related comment. It was funny last evening as the game went to commercial and the grandsons started talking only to be advised that unlike any other football game, it was time to be quiet during the commercials rather than ask questions and make noise. Punxsutawney Phil saw his shadow as reported in the Syracuse Post-Standard, although I could not find it live on the national news. 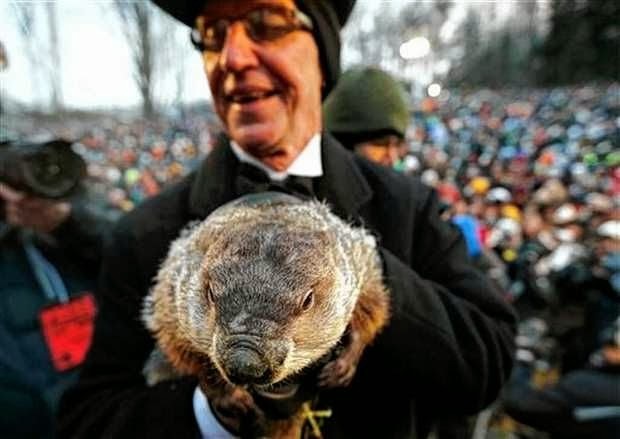 PUNXSUTAWNEY, Pa. -- Punxsutawney Phil, most famous groundhog in history, emerged from his burrow early Sunday morning and with the help of his handlers declared that he saw his shadow. 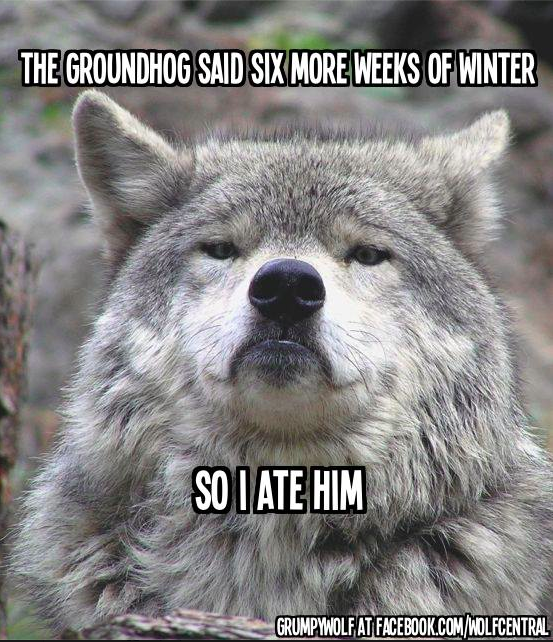 The Groundhog Day prediction means six more weeks of winter. I kinda felt it would happen this way. Believe it! Today is February 2nd and the 33rd day of, the still too young to be in the second month, of the year. Gobbler's Knob in the sleepy village of Punxsutawney, PA, for an early Spring and a long swimming season this year. Let's get on it! If you see your shadow, you'll be in someone's stew by the end of the day. The country is depending upon you! 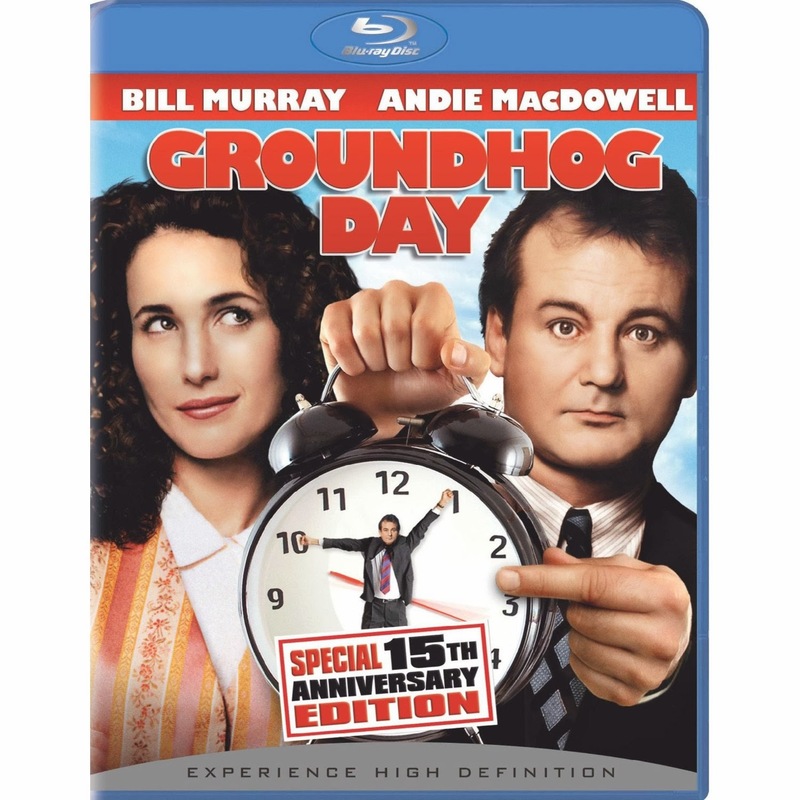 I love Groundhog Day. It is a classic American holiday! Sadly, the movie by the same name is also a classic, but not as authentic. 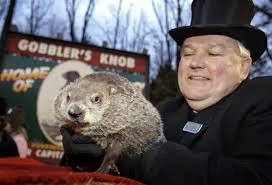 Phil is expected to depart his burrow at 7:20 AM EST to make the hopefully early end to Winter forecast. I will be watching. And hoping that this Winter which started early decides to give me a break, and end early as well. The prognosticators are all predicting that Phil will not see his shadow--time will tell! It has been a while since I wrote about some leadership principles that I discover while plodding through the daily grind. 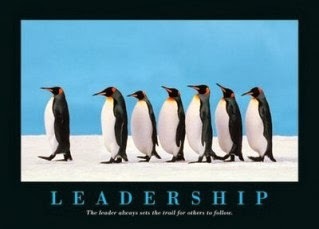 I have recently revisited the concept of consistent and tenured leadership. Given the current upheaval in government with a bipartisan and ineffective Congress coupled with a diminished President, now is the time to find leaders that know how to plan for the long-haul and can keep the organization steady during turbulent times. Good leaders have tenure. They are stay in place and they develop depth and understanding in the subject and more importantly the people they lead. Good leaders are prepared to accept the consequences of their decisions in five years--fully expecting to be the leader that made the decisions or sponsored the decisions. That is hard to comprehend in a society and work paradigm that promotes changing leaders every two to three years. Yet, when I look at some very senior leaders, I find that the best ones have been in place for many years and their organizations have continued to excel, despite the paradigm that suggests changing leaders is essential. Leaders who stay in place are committed to building teams and team leaders who are in place for the long haul. The idea of making a mark is measured in terms of years of consistent success rather than a single big splash in the pool of work life. We have become a society of the quick-win! Ugh! Quick wins are a facade and are not a barometer of long term success. Successful long-term tenured leaders must be committed to continual evolution and improvement rather than looking for and snapping off the "low-hanging fruit" to get a quick win so they can declare success before moving on to another job. Leaders for the long-term develop a culture of innovation and change enabling the organization or team to stay ahead of the technologies that affect their business line. Don't misunderstand, the infusion of new ideas and business approaches from outside the organization is critical. An organization will wither from deficient innovation and failing to maintain its mission lead. But, the infusion of new ideas and practices does not occur through revolving door leaders. It happens when an organization is committed to learning, leaning forward, and developing tradecraft. Leaders set the tone and the ethos for an organization, but it is truly the team that encourages innovation and not leadership change for he sake of change.